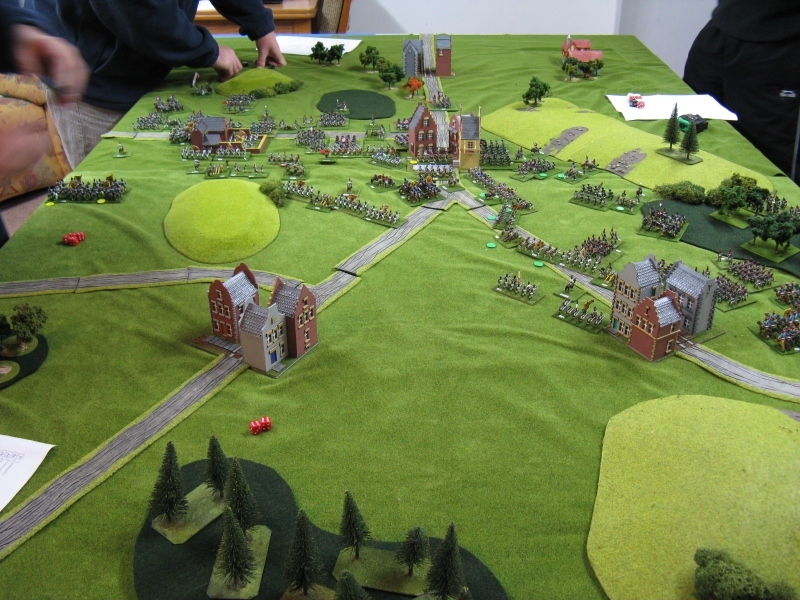 Our last Wednesday night tabletop punch-up was a Volley & Bayonet game comprising a Revolutionary French Army versus an Allied force of British and Austrians somewhere in Belgium. All the figures, scenery and scenario notes were care of our V & B expert and war gamer extraordinaire Adrian Powell. Adrian has yet to put on a dud game and they are often on the grand scale. The Allies defended a number of towns and hamlets somewhere in Belgium with the British forces (myself), deployed in defence, whilst their Austrian allies, (Geoff) arrived from the far end of the table. The large French force, comprising two armies, commanded by (Wayne and Mike) were tasked with capturing the towns, with 2 points for each captured town and 5 for each enemy division forced to exhaustion. Similar points were allocated to the Allies in a vice versa fashion. The French Armies, whilst large, were of inferior quality, being mostly M4, and possessed a limited force of cavalry. The small British infantry force was all top notch M5, and two of the Highland units were M6. The Austrians infantry was similar quality to the French with the exception of 2 Grenadier units that were M6 and their large Cavalry force was all class at M5. Artillery numbers were similar for both forces. The French, deciding that they had the numbers, opted for a rapid and blunt frontal assault on all three of the foremost towns and hamlets. They were counting on the much smaller British force being a pushover and at first glance I didn't think I had a hope in hell of holding out till my Austrian allies arrived. Fortunately the dice gods were to look favourably upon my endeavours this particular evening. From the start my stationary artillery began an effective bombardment of the advancing Frenchmen. As the French came in range of the British muskets I commenced throwing sixes with ease and their preliminary assaults were checked and thrown back right across the entire front. Follow up assaults by the French also failed to make any impression on the British line and by turn three the Austrians were moving into position to bolster the British line and put pressure on the French flanks with their cavalry. Not one to muck about, the Austrian C in C (Geoff) launch a cavalry attack on the French left flank that sent the French into disarray and caused an infantry unit to rout. Emboldened by their success the Austrian Cavalry lined up a unit of French cavalry and plunged headlong into them causing the French to recoil. Bear in mind the French still had huge numbers, albeit second rate, so these initial setbacks had not dampened their enthusiasm for the assault. The next three turns saw possession of two of the towns see-sawing between both sides. No sooner would the French batter their way in but a determined counterattack would throw them out again. Fortunately for the Allies, the Austrian reserves were playing their part in evening-up the battle of attrition. By now some of the French units were looking decidedly shaky. In fact one of Wayne's three Divisions was on the brink of exhaustion and a duff morale test confirmed this. Henceforth his units could not advance to the enemy or go stationary for firing and were permanently disordered. Sensing the balance was tipping in their favour the Allies threw another dashing cavalry attack on the faltering French Right Flank which sent the Frenchmen reeling and followed up with massed infantry charges all along their front. The higher morale of their British units was a deciding factor in many of the melees. By turn 8 another of Wayne's depleted Divisions went exhausted and his remaining unit wasn't looking too flash either. Mike's French army was, surprisingly, still in reasonable shape though one division was close to exhaustion. On the Allied side two of the British divisions were in a pretty ragged state but fluky morale throws by yours truly was keeping them at their task whilst all the Austrian units were in fine fettle. Sadly for the French the Battle had slipped from their grasp and the decision to withdraw rather than batter themselves to pieces needlessly was agreed upon by the French command. As I said at the start, the dice gods well and truly were smiling on me this night and the superior morale of my troops couple with Wayne's abysmal bad luck played a big part in delaying the French attacks till my Austrian ally and his very aggressive cavalry arrived. Special credit to Adrian Powell for his beautifully presented Essex figures of which he has thousands and his outstanding scratch built buildings...being an Architect clearly improves ones modelling skills. Adrian always puts on a well balanced and challenging game and his expert knowledge of V & B rules ensures there are no time wasting arguments and the games crack along at a brisk pace. Excellent report, with some great looking figures and terrain. Beautiful pictures, great figures and terrain sir. You have done well Gav. Sorry I missed the game. I still crook. Today first day near a computer since Sunday night. Have not been to work this week, a first for more than 10 ten years. It seems the 'dreaded lurgie' is rampant in Chch at the moment mate, I've just had a couple of days off myself with blocked sinuses and and a sore throat. Cant remember the last time I was off work sick. Good to see you're back at the computer.